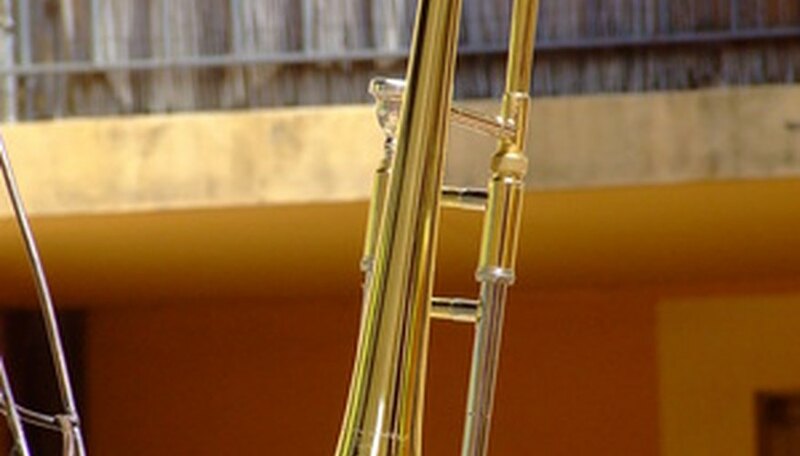 The sound of a trombone is created by the bore size. The bore is the diameter of the trombone slides that run from the mouthpiece to the bell of the horn. Typically a bass trombone has a bore of 0.560 inches or larger and a bell size of 9 to 10.5 inches. A tenor trombone has a bore that ranges from 0.490 inches to 0.542 inches. An alto trombone has a bore that ranges from 0.450 inches to 0.500 inches with a 6.5 inch or 7 inch bell. The bore size of the mouthpiece also affects the final sound of the trombone. The bore size of the trombone should be published with the instrument specifications, but often the bore size of the mouthpiece is unknown. Clean the dial caliper with a cloth. Close the caliper and ensure that the dial is pointed at the zero mark. If it doesn't point to zero, then adjust the dial. Open the caliper and fit the slides of the trombone between the caliper jaws. Adjust the jaws so that each one sits tight on either side of the slide. Read the measurement of the main scale that sits over the slide between the jaws of the caliper. Then read the measurement on the dial of the caliper. The arrow on the dial will provide this second measurement. Write down these measurements. This is the bore size of your trombone. Clean the dial caliper with a cloth. Close the caliper and ensure that the dial is pointed at the zero mark. If it doesn't point to zero, adjust the dial. Open the internal jaws on the dial caliper. These are much smaller than the outer jaws. Place these in the small end of the mouthpiece. Press the small jaws against the inside walls of the mouthpiece. Take the measurements in the same way outlined in Step 3. Write down these measurements. This is the bore size of your trombone mouthpiece.